Macroalgae play a crucial role in marine ecosystems when they contribute to the global primary production in the habitats formation, providing food and shelter to a range of aquatic organisms. They have a number of interactions with bacteria and other organisms such as fouling and disease. To inhibit the settling, growing, and biofilm formation by bacteria, it has been suggested that the macroalgae influence bacterial metabolism and quorum sensing through the production of secondary metabolites with antibiotic effect. Macroalgae-bacteria interactions have been investigated for many years. These interactions can be beneficial when the bacteria assist with the normal development of macroalgae as well as reducing secondary fouling on the algal surface. On the other hand, the interactions may have a deleterious effect when the biofilm impairs the photosynthetic ability or promotes disease development. 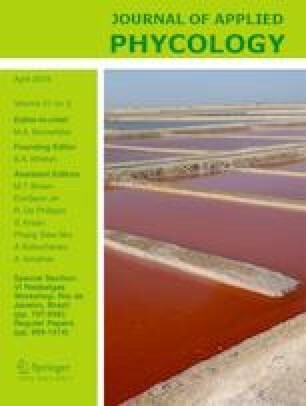 This review reports the recent advances in the understanding of bacteria-brown algae interactions, highlighting the diversity and functional role of epiphytic bacteria, including the maintenance of the health of the algae and the biological activities described from this association. Through combined bacterial culture, microscopy, and molecular biology, it has been possible to identify and establish the phylogenetic origin of different bacterial communities associated with brown algae, being predominantly the phyla Proteobacteria, Bacteroidetes, and Firmicutes. Further investigation of the bacterial communities that live on different macroalgae using new technologies are still required, mainly to evaluate the production and secretions of metabolites with biotechnological potential. The online version of this article ( https://doi.org/10.1007/s10811-018-1573-4) contains supplementary material, which is available to authorized users. The first author is thankful to Coordenação de Aperfeiçoamento de Pessoal de Nível Superior (Capes) for the PhD fellowship. This study was supported by Conselho Nacional de Desenvolvimento Científico e Tecnológico (CNPq) and Fundação de Amparo à Pesquisa do Estado do Rio de Janeiro (FAPERJ). The authors also thank the collaboration of MSc. Ana Débora Nunes Pinheiro in the review of English and suggestions for this manuscript.